Stolen Car Strikes Motorcycle, Kills Rider and Injures Passenger. What Should You Do if You’re Involved in a Motorcycle Accident? The Orange County Register reports that in the first week of August, a stolen Honda Accord struck a motorcycle in Modjeska Canyon, killing the rider and seriously injuring his passenger. The collision occurred near Santiago Canyon Road and Falcon Street in the mid-afternoon. The stolen car was found abandoned by the side of the road, the driver having fled the scene. At the time of writing, the driver had not yet been located. 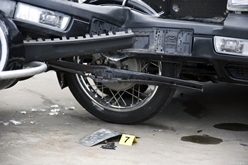 Motorcycle accidents can be extremely dangerous, as riders aren’t protected by the metal frame and paneling that surrounds an automobile driver. To help avoid being in an accident as a motorcyclist, be sure to practice safe riding habits. For example, work to maintain good lane positioning with respect to other vehicles to increase your visibility, and slow down at intersections, especially in rural areas. Get to safety. Try to get out of the road immediately to avoid being struck by oncoming traffic. Stay away from vehicles leaking flammable fluids and watch out for other hazards. See if anyone is hurt. Make sure that you’re not injured, then check on others. Call 9-1-1 if there is an injury. Motorcycle accidents can cause internal injuries that aren’t visible but can prove fatal if left untreated, so if in doubt, call 9-1-1. Gather information. Speak with the other driver only to make sure they’re not in need of medical assistance and to collect their contact and insurance information. Don’t chat or say anything that could be taken as an admission of fault. Collect evidence. If you can do so safely, take photos of the scene and surrounding area, including any street signs or nearby buildings. If you are ever involved in a motorcycle accident and would like to discuss your legal options, Steinberg Injury Lawyers has been handling accident and injury cases just like yours for over 34 years. We’re here to help when you need us, day or night, so call us at 800-989-6385 for a free case evaluation.